The role of sales is changing dramatically in our connected world. Buyers are much more likely to arrive in the buying cycle equipped with product knowledge, solution alternatives and a general idea about cost. Today, buyers do their own research, and when the time does come to speak with a salesperson, they are very likely to be close to a decision. The content marketing trend that so many B2C and even B2B businesses are employing further facilitates this process by offering high-value, free content via websites, social media & apps. So where does ‘Guided Selling’ fit in with all this? Guided selling simply refers to a process whereby potential buyers are assisted down a path that leads them to a purchase decision. High quality guided selling should be helpful and welcomed by prospective customers and match them up with a product or service that precisely meets their needs and wants. Modern sales teams may no longer employ the guided selling methodology from scratch, rather, they now work with knowledge-empowered buyers on mid- to late-cycle issues related to actual selling and confirming specific product details. The good news for sales people is that; you can forget about making a million calls per day to cold phone numbers answered by grumpy people who verbally abuse you if they bother to answer the phone at all. Nope, your day will be different. First, you may pick up a copy of your company web traffic report. Who has visited your web page, and specifically who has been looking at the product you sell? Next, take a look at who has downloaded content and what content they downloaded. As you look over these lists, your eye is drawn to several names that you’ve seen before. Your CRM system informs you that one of these guys has been downloading product literature about your line of forklifts. Your next interesting clue is that the company the guy works for is a distributor of fresh-food products. You check your Configure Price Quote (CPQ) system to see if your products have any particular utility in the fresh-food distribution arena. There are several references to attachments designed to handle large quantities of food stuffs in a sanitary manner. Also, long-life, quick-charge batteries are a recommended up-sale item for food service since downtime means spoiled food. You send an email to the fellow thanking him for downloading your product brochure. You also attach a PDF with an industry story about new long-life/quick-charge battery technology in electric-powered forklifts. Approximately 15 minutes later, a phone call comes in from this fellow. He wants to ask some questions about your batteries and their performance specs. Your CPQ system can then drive the conversation for you. It automatically ‘remembers’ all of the conditional questions, the environment and the regulatory requirements. The CPQ system makes you sound like a genius, and your new friend is feeling very confident in your ability to help them with their unique needs. Now you are in a sales engagement—no cold call, no prospecting. Just two people in business talking over the needs one person has and how they might best be addressed. CPQ guides the conversation between the sales rep and buyer to establish a clear understanding of what is needed. 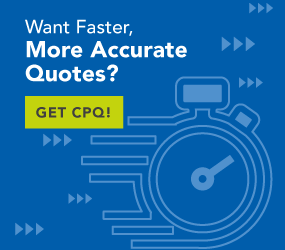 The sales rep doesn’t need to remember the many variations of capability addressed through the various product configurations, CPQ does that for both the salesperson and the buyer. If no solution is configurable, the rep and buyer know and understand that quickly as well. CPQ can also help the sales rep identify possible cross-selling and up-selling opportunities that may be presented to the buyer as enhanced capabilities for a more complete solution or as differentiated capabilities for a solution to another issue altogether. In cases where standard configurations are close to customer specs but fall short in some way, CPQ is the gateway to evaluating an E2O solution through estimating. This assures the customer that the price and value delivered are aligned, and the sales rep is further assisted with automated proposal generation. By building this intelligence into CPQ, sales doesn’t require the extended education cycles traditionally associated with new products or major product changes. CPQ learns about new solutions instantly and instantly enables the sales rep with updated information. CPQ becomes the product expert, and the sales rep can be the selling expert utilising a high quality guided selling approach.